Five Latin American nations' football associations have been fined by Fifa for their fans' homophobic chanting during matches. 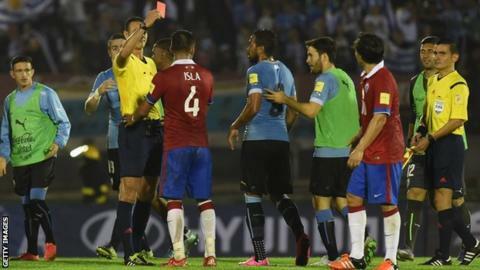 Chile were fined 70,000 Swiss francs (£48,073) for four incidents in 2018 World Cup qualifying games. Argentina, Mexico, Uruguay and Peru were each fined £13,735 for individual cases of "discriminatory" chanting. Honduras' FA is under investigation by world football's governing body for similar breaches of discipline. "We have been fighting discrimination for many years and one part of that has been through sanctions," said Claudio Sulser, chairman of Fifa's disciplinary committee. "Disciplinary proceedings alone cannot change behaviour by certain groups of fans that unfortunately goes against the core values of our game." Chile's sanctions follow their recent qualifiers against Brazil, Peru, Colombia and Uruguay. Peru and Uruguay were fined for chanting in the same fixtures. The other games specified in Fifa's disciplinary report were Argentina v Brazil, and Mexico v El Salvador.